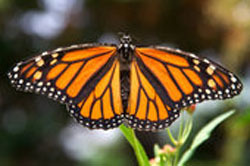 Well, those spectacular Monarch butterflies are in motion again, heading north on their spring migration from Mexico. Today I was lucky to observe several orange clouds bobbing over the vast dry desert between Arizona and California, fluttering wings filling the crisp blue sky. The mass migration of the Monarch butterfly is a true wonder of nature—a sight that captures the eye and boggles the mind! For this year’s flock, it’s a journey that began many months and miles ago. In late spring and early summer Monarch eggs are laid on one type of plant called a milkweed. Hatching from eggs in North America and Canada, tiny yellow, black and white striped Monarch larvae (better known as caterpillars) spend their earliest days eating and growing. Then each animal forms a chrysalis (also called a cocoon). Emerging ~14 days later, they take to the breeze on outstretched wings thin as tissue and painted with that dazzling orange and black pattern. Once adults, most Monarchs are spurred by a deep instinct to find a very specialized habitat of fir forest that only exists on twelve mountaintops in central Mexico. Hoards of butterflies travel ancient pathways on their southbound migration to winter over—and mate. Then the rising temperatures of March send the Monarchs flooding north again. This time they are in a race against time. The butterflies only have short time to live, to travel toward their homelands and lay eggs of their own. At which point, the cycle begins anew. This entry was posted in Desert Dwelling, Earth’s Amazing Creatures. Bookmark the permalink.